The creation of The St. Louis Planter resulted from a specific need identified in 2005 for an attractive, durable and large urban scale landscape planter to realize Gateway Greening’s landscape enhancement goals for Kiener Plaza as part of participation in the Urban Roots downtown St. Louis landscape enhancement initiative. Inspired by St. Louis’ early French heritage, the fleur-de-lis forms the primary decorative feature for creating an urban scale landscape planter unique for St. Louis, designed by SWT Design and ultimately crafted by Cassilly and Cassilly. 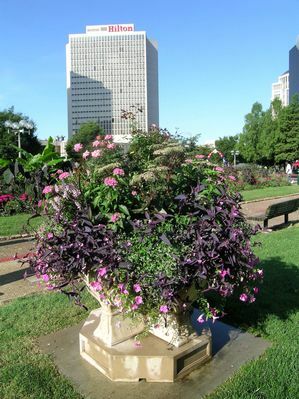 The placement of the initial 14 Plaza Planter edition of The St. Louis Planter at Kiener Plaza in spring 2006 was made possible by the generosity of the Gateway Foundation. Additional sponsorships assisted Gateway Greening with pursuing the design and fabrication of a mold for creating the larger Parkway Planter. The first pair of Parkway St. Louis Planters was created in spring 2007 and placed at Kiener Plaza’s eastern Broadway Avenue entrance. Themed designs: "Follow the Yellow Brick Road" and "Little Shop of Horrors"